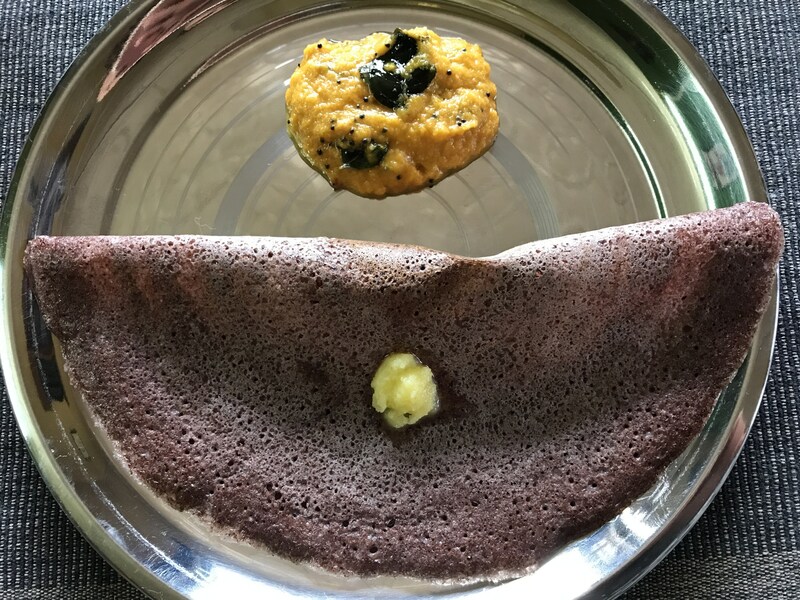 After black rice pudding or Karuppu kavuni Arisi payasam, my next wish was to try Karuppu Kavuni Dosai. 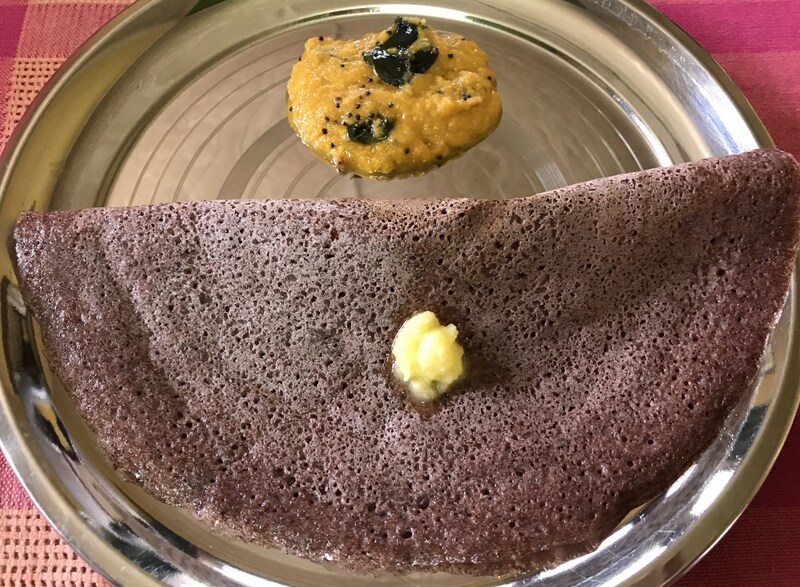 Dosais or Dosas are more flexible than making those perfect soft rice/millet idlies or fluffy cakes . Any grain base and lentil is enough to produce soft pancakes. 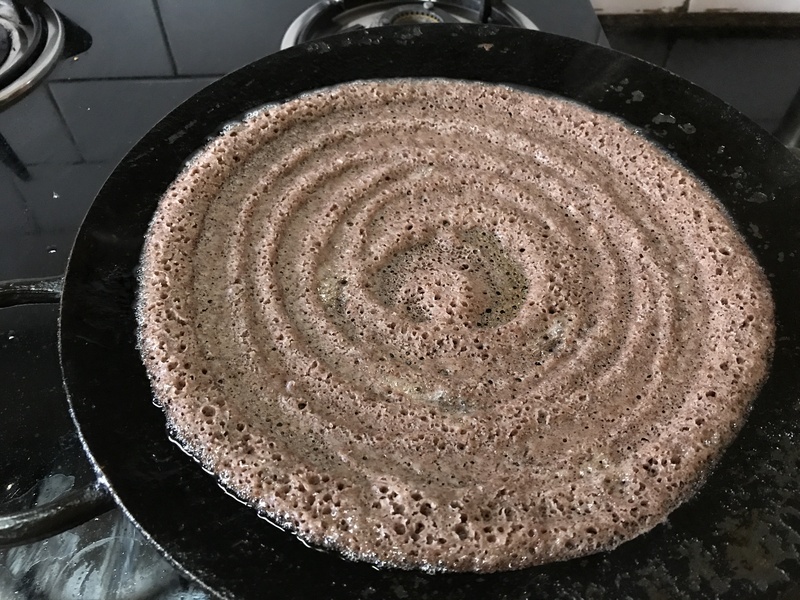 While the western pancakes can be made with ground grain or flour alone, the South Indian Dosai has a protein lentil combined for the extra magical crisp or the soft spongy texture. Hence, give us a grain and we can produce Dosai. Surprisingly very true. 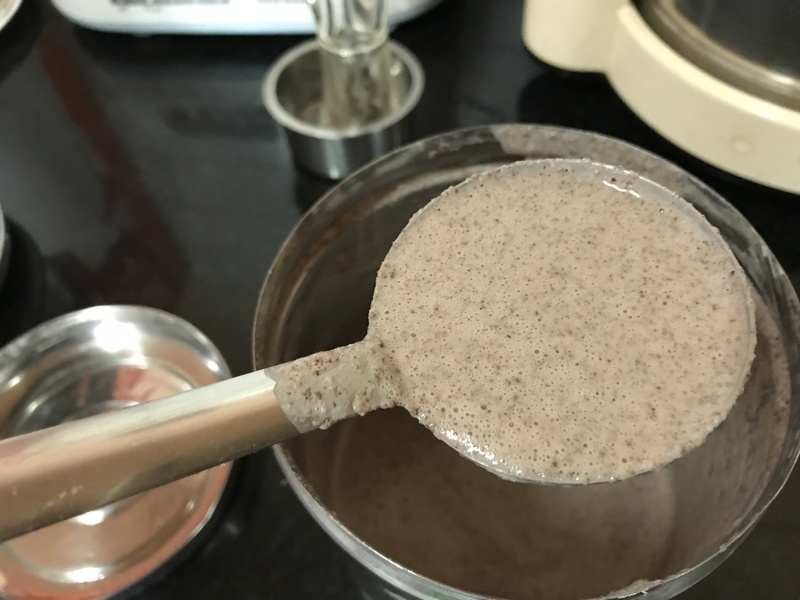 This was how the series – ‘Power Packed Pancakes’ with high fibre, nutrient rich millets came up. 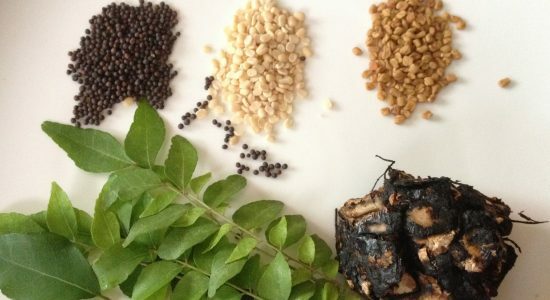 I am always awe-struck by the innovative culinary minds of our ancestors, who explored the combination of blackgram for the fermentation process of idlies and dosais – which aids in natural bacterial growth, than the additional usage of other external baking or steaming agents. That has given us- the generational followers, a clear way to explore a few more. 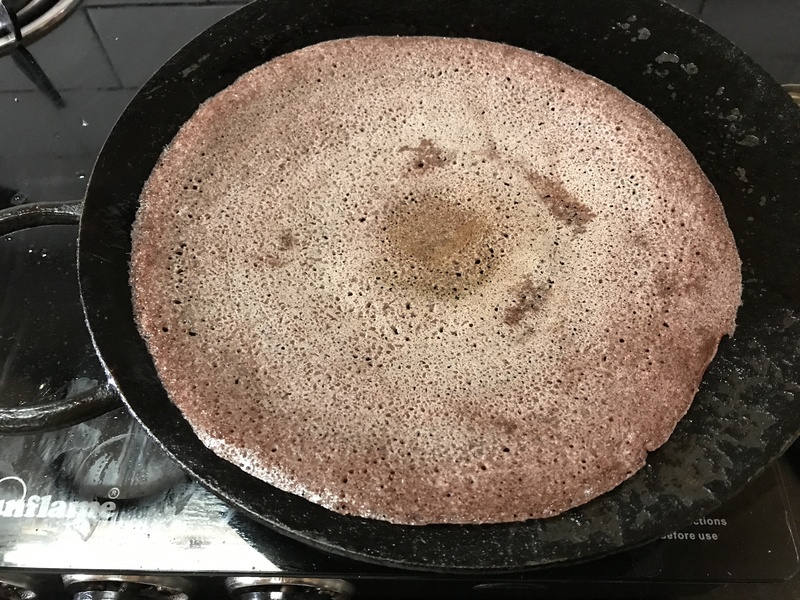 Now, it’s time to try Tamilnadu style pancakes – the heavenly Dosais with various rices, which also seem to be common in southeast Asian countries. Wash well black rice and black gram. Once ground into a fine batter add rock salt and mix well or grind the rock salt in the end. Leave the batter overnight or until fermented well. Dosai batter is ready for use. 5. Take out once done- remember it would take just about 30-50 seconds to cook a side of thin Dosai. If one keeps it longer, the texture of pancake would be lost. 6. Make Karuppu Kavuni Dosai crisp or soft and enjoy with any Thuvayal/chutney. 7. A dollop of nei/clarified butter is an extravagant addition to the beautiful Dosai. Can we use the water in which the kavuni rice is soaked for grinding ? apologies for the delayed reply. All rice varieties have arsenic content, which is toxic. 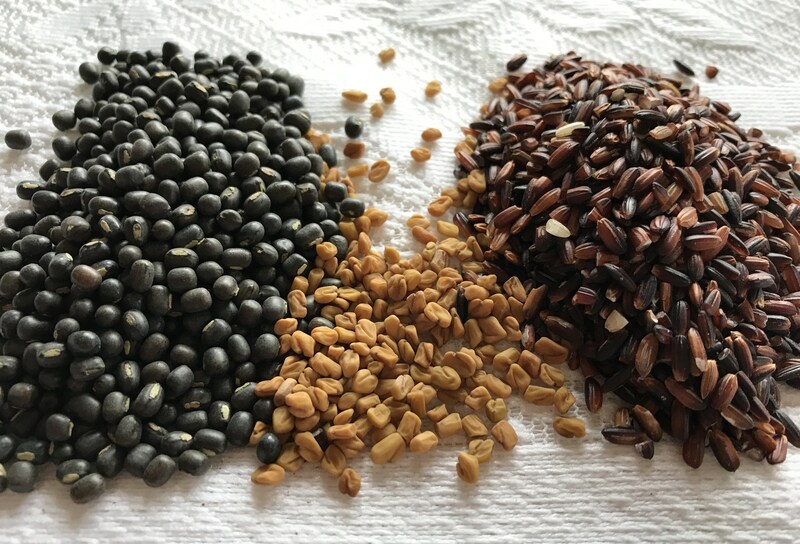 Brown, Red or Black rice varieties have more arsenic than White rice. Arsenic is a mineral found naturally in the soil and also added to the soil through pesticides used by farmers. Hence, it is advisable to soak the rice for 8 hours and throw away the water and wash the rice again before grinding. As far as consuming cooked red rice, it is advised to soak rice overnight and cook it in 6 to 8 parts of water and draining off water after cooking. By this the arsenic levels in the rice is greatly reduced.